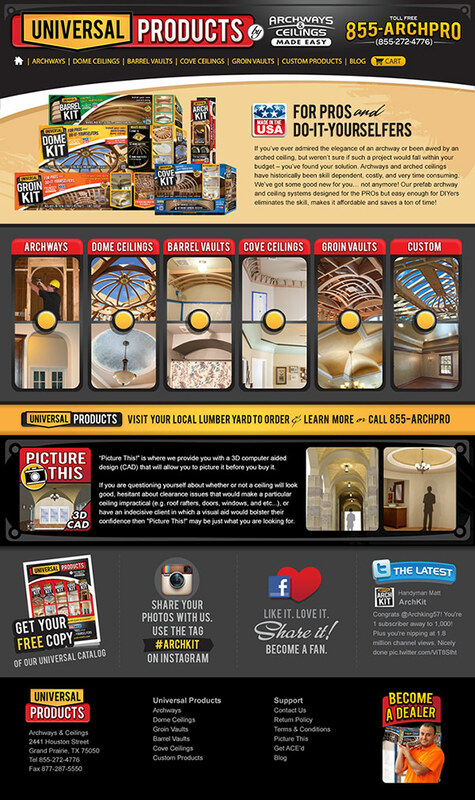 Product website for Archways & Ceilings Made Easy (ACME) and their universal arch and ceiling product kits. To create a bold and engaging interface showing off ACME’s ready-to-install kits as well as show off the custom product capabilities of ACME. These guys have an awesome product line that offers home builders, renovators and DIY remodelers pre-formed and precisely cut wooden arches. We needed to convey the full range of products and their value, from the ability to quickly install an arch in a doorway to easily installing an entire dome ceiling. We worked with the guys at ACME to establish the branding and design the graphic interface. We built the layered PhotoShop files and made a clean hand-off to their web developer to optimize and prep for the web.